Why has it been raining all day? Normally the rain we get in Bangkok is convectional (meaning that it is generated from the heat of the sun through the day). But over the last couple of days there has been a tropical depression that has made landfall over middle Vietnam passing Laos PDR and Ubon Ratchathani, Thailand and downgraded to the low pressure cell through the Northeast. At 4.00 a.m. on 20 September, the low pressure covers provinces of Saraburi, Lop Buri and Nakhon Nayok. Lop Buri, Ang Thong, Suphan Buri and Phra Nakhon Si Ayutthaya, as well as Bangkok and Vicinity. Another storm “USAGI” east of the Philippines, tracks west-northwest to the upper part of the country. 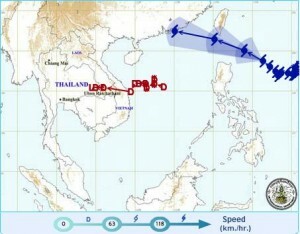 It is forecast to move to the South China Sea. So this might not be the worst of it.